Geothermal waters and examples of their manifestation in the landscape. Hot springs, springs that emit water ranging in temperature from about 30° to 104°C, are found in two geologic settings. 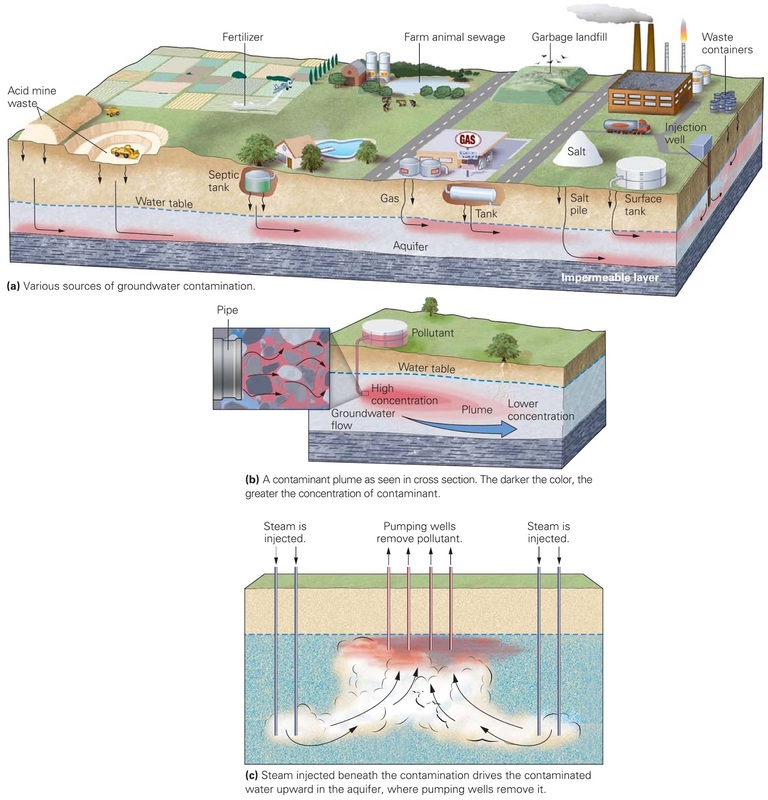 First, they occur where very deep groundwater, heated in warm bedrock at depth, ﬂows up to the ground surface. This water brings heat with it as it rises. 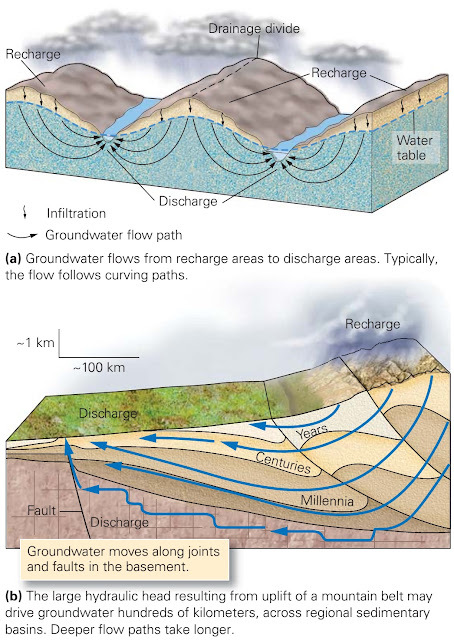 Such hot springs form in places where faults or fractures provide a high-permeability conduit for deep water, or where the water emitted in a discharge region followed a trajectory that ﬁrst carried it deep into the crust. Second, hot springs develop in geothermal regions, places where volcanism currently takes place or has occurred recently, so that magma and/or very hot rock resides close to the Earth’s surface (figure above a). Hot groundwater dissolves minerals from rock that it passes through because water becomes a more effective solvent when hot, so people use the water emitted at hot springs as relaxing mineral baths (figure above b). Natural pools of geothermal water may become brightly coloured the gaudy greens, blues, and oranges of these pools come from thermophyllic (heat-loving) bacteria and archaea that thrive in hot water and metabolize the sulphur containing minerals dissolved in the groundwater (figure above c). Numerous distinctive geologic features form in geothermal regions as a result of the eruption of hot water. In places where the hot water rises into soils rich in volcanic ash and clay, a viscous slurry forms and ﬁlls bubbling mud pots. Bubbles of steam rising through the slurry cause it to splatter about in goopy drops. Where geothermal waters spill out of natural springs and then cool, dissolved minerals in the water precipitate, forming colourful mounds or terraces of travertine and other chemical sedimentary rocks (figure above d). Under special circumstances, geothermal water emerges from the ground in a geyser (from the Icelandic spring, Geysir, and the word for gush), a fountain of steam and hot water that erupts episodically from a vent in the ground (figure above e). 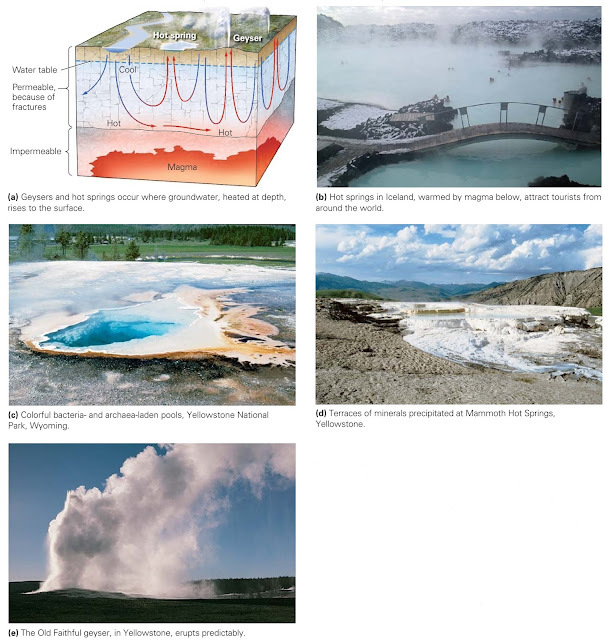 To understand why a geyser erupts, we ﬁrst need a picture of its underground plumbing. Beneath a geyser lies a network of irregular fractures in very hot rock; groundwater sinks and ﬁlls these fractures. Heat transfers from the rock to the groundwater and makes the water’s temperature rise. Since the boiling point of water (the temperature at which water vaporizes) increases with increasing pressure, hot groundwater at depth can remain in liquid form even if its temperature has become greater than the boiling point of water at the Earth’s surface. 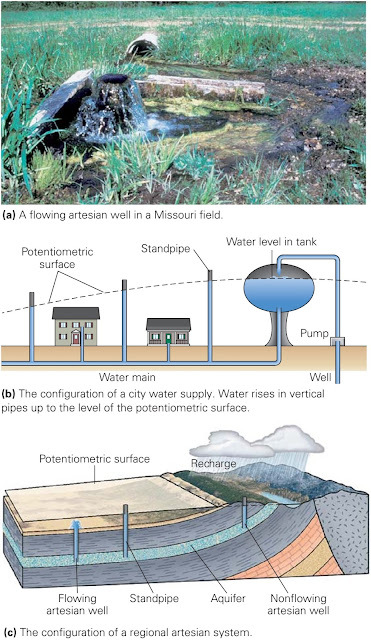 When such “superheated” groundwater begins to rise through a conduit toward the surface, pressure in it decreases until eventually some of the water transforms into steam. 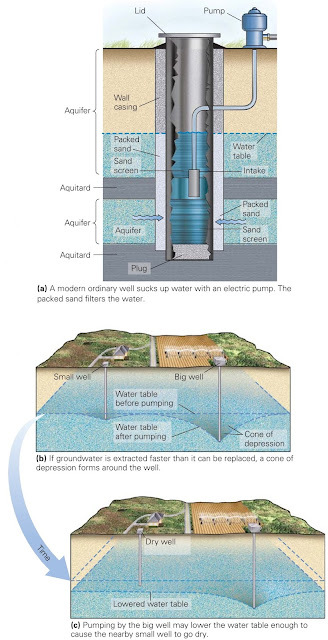 The resulting expansion causes water higher up to spill out of the conduit at the ground surface. When this spill happens, pressure in the conduit, from the weight of overlying water, suddenly decreases. A sudden drop in pressure causes the super-hot water at depth to turn into steam instantly, and this steam quickly rises, ejecting all the water and steam above it out of the conduit in a geyser eruption. Once the conduit empties, the eruption ceases, and the conduit ﬁlls once again with water that gradually heats up, starting the eruptive cycle all over again. 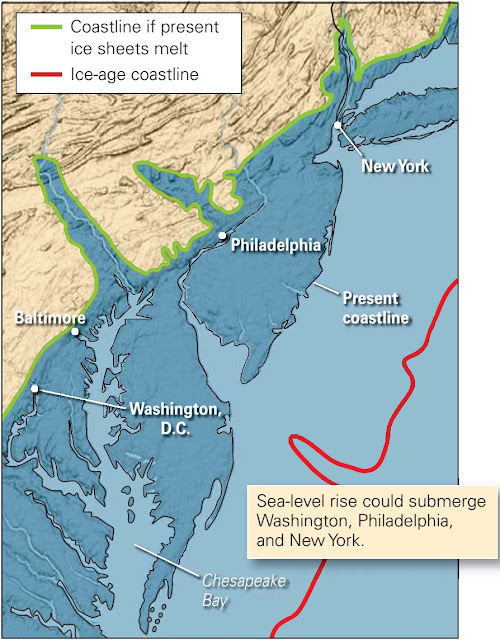 Future sea-level rise, due to melting of polar ice, would flood many coastal cities. People tend to view a shoreline as a permanent entity. But in fact, shorelines are ephemeral geologic features. On a time scale of hundreds to thousands of years, a shoreline moves inland or seaward depending on whether relative sea level rises or falls or whether sediment supply increases or decreases. In places where sea level is rising today, shoreline towns will eventually be submerged. For example, the Persian Gulf now covers about twice the area that it did 4,000 years ago. And if present rates of sea-level rise along the East Coast of the United States continue, major coastal cities such as Washington, New York, Miami, and Philadelphia may be inundated within the next millennium (figure above). In a matter of hours, a storm especially a hurricane can radically alter a landscape that took centuries or millennia to form. The backwash of storm waves sweeps vast quantities of sand seaward, leaving the beach a skeleton of its former self. The surf submerges barrier islands and shifts them toward the lagoon. Waves and wind together rip out mangrove swamps and salt marshes and break up coral reefs, thereby destroying the organic buffer that can protect a coast, leaving it vulnerable to erosion for years to come. Of course, major storms also destroy human constructions: erosion undermines shore-side buildings, causing them to collapse into the sea; wave impacts smash buildings to bits; and the storm surge very high water levels created when storm winds push water toward the shore ﬂoats buildings off their foundations (figure above a, b). 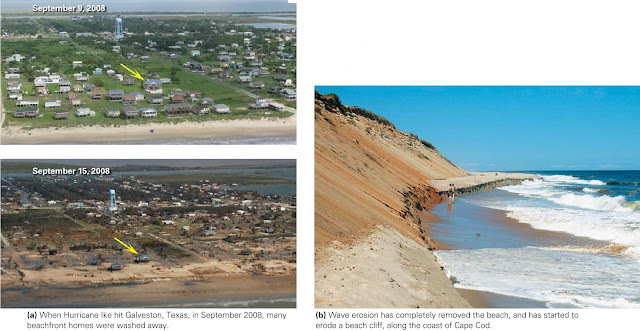 But even less-dramatic events, such as the loss of river sediment, a gradual rise in sea level, a change in the shape of a shoreline, or the destruction of coastal vegetation, can alter the balance between sediment accumulation and sediment removal on a beach, leading to beach erosion. In some places, beaches retreat landward at rates of 1 to 2 m per year. Techniques used to preserve beaches. In many parts of the world, beach front property has great value; but if a hotel loses its beach sand, it probably won’t stay in business. Similarly, a harbour can’t function if its mouth gets blocked by sediment. Thus property owners often construct artiﬁcial barriers to alter the natural movement of sand along the coast, sometimes with undesirable results. For example, beach-front property owners may build groins, concrete or stone walls protruding perpendicular to the shore, to prevent beach drift from removing sand (figure above a). Sand accumulates on the up-drift side of the groin, forming a long triangular wedge, but sand erodes away on the down-drift side. Needless to say, the property owner on the down-drift side doesn't appreciate this process. Harbour engineers may build a pair of walls called jetties to protect the entrance to a harbour (figure above b). But jetties erected at the mouth of a river channel effectively extend the river into deeper water and thus may lead to the deposition of an offshore sandbar. 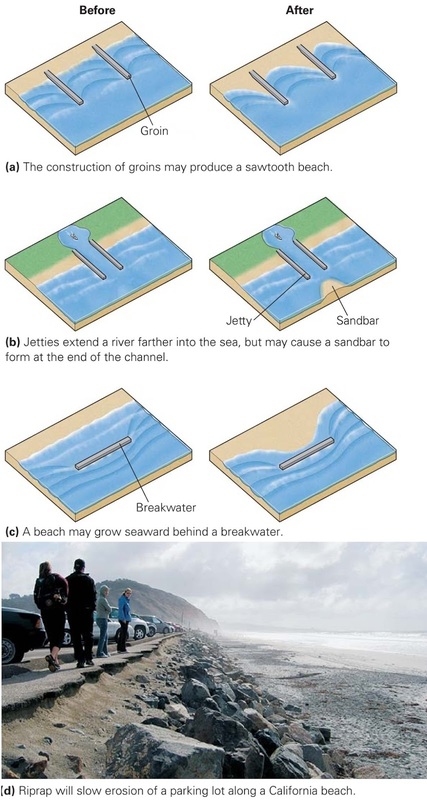 Engineers may also build an offshore wall called a breakwater, parallel or at an angle to the beach, to prevent the full force of waves from reaching a harbour. With time, however, sand builds up in the lee of the breakwater and the beach grows seaward, clogging the harbor (figure above c). To protect expensive shore side construction, people build seawalls out of riprap (large stone or concrete blocks) or reinforced concrete on the landward side of the beach (figure above d), but during a storm, these can be undermined. In some places, people have given up trying to decrease the rate of beach erosion and instead have worked to increase the rate of sediment supply. To do this, they pump sand from farther offshore, or truck in sand from elsewhere to replenish a beach. This procedure, called beach nourishment, can be hugely expensive and at best provides only a temporary ﬁx, for the backwash and beach drift that removed the sand in the ﬁrst place continue unabated as long as the wind blows and the waves break. Bad cases of beach pollution create headlines. Because of beach drift, garbage dumped in the sea in an urban area may drift along the shore and be deposited on a tourist beach far from its point of introduction. Oil spills, from ships that ﬂush their bilges or from tankers that have run aground or foundered in stormy seas, or from offshore well leaks, have contaminated shorelines at several places around the world. The inﬂux of nutrients, from sewage and agricultural run-off, into coastal waters can create dead zones along coasts. A dead zone is a region in which water contains so little oxygen that ﬁsh and other organisms within it die. Dead zones form when the concentration of nutrients rises enough to stimulate an algae bloom, for overnight respiration by algae depletes dissolved oxygen in the water, and the eventual death and decay of plankton depletes oxygen even more. One of the world’s largest dead zones occurs in the Gulf of Mexico, offshore of the Mississippi River’s mouth. Coastal wetlands and coral reefs are particularly susceptible to changes in the environment, and many of them have been destroyed in recent decades. Their loss both increases a coast’s vulnerability to erosion and, because they provide spawning grounds for marine organisms, disrupts the global food chain. Destruction of wetlands and reefs happens for many reasons. Wetlands have been ﬁlled or drained to be converted to farmland, housing developments, resorts, or garbage dumps. Reefs have been destroyed by boat anchors, dredging, the activities of divers, dynamite explosions intended to kill ﬁsh, and quarrying operations intended to obtain construction materials. Chemicals and particulates entering coastal water from urban, industrial, and agricultural areas can cause havoc in wetlands and reefs, for these materials cloud water and/or trigger algal blooms, killing ﬁlter-feeding organisms. Toxic chemicals in such run-off can also poison plankton and burrowing organisms and, therefore, other organisms progressively up the food chain. Global climate change also impacts the health of organic coasts. For example, transformation of once vegetated regions into deserts means that the amount of dust carried by winds from the land to the sea has increased. This dust can interfere with coral respiration and can bring dangerous viruses. A global increase in seawater temperature may be contributing to reef bleaching, the loss of coral colour due to the death of the algae that live in coral polyps. The statistics of wetland and reef destruction worldwide are frightening ecologists estimate that between 20% and 70% of wetlands have already been destroyed, and along some coasts, 90% of reefs have died. Global-scale convection of the atmosphere, inﬂuenced by the Coriolis effect, causes currents of warm air to ﬂow steadily from east to west in tropical latitudes. As the air ﬂows over the ocean, it absorbs moisture. Because air becomes less dense as it gets warmer, tropical air eventually begins to rise like a balloon. As the air rises, it cools, and the water vapour it contains condenses to form clouds (mists of very tiny water droplets). If the air contains sufﬁcient moisture, the clouds grow into a cluster of large thunderstorms, which consolidate to form a single, very large storm. Because of the Coriolis effect, this large storm evolves into a rotating swirl called a tropical disturbance. If the disturbance remains over warm ocean water, as can happen in late summer and early fall, rising warm moist air continues to feed the storm, fostering more growth. Eventually a spiral of rapidly circulating clouds forms, and the tropical disturbance becomes a tropical depression. Additional nourishment causes the tropical depression to spin even faster and grow broader, until it becomes a tropical storm and receives a name. If a tropical storm becomes powerful enough, it becomes a tropical cyclone. Formally deﬁned, a tropical cyclone is a huge rotating storm, which forms in tropical latitudes, and in which winds exceed 119 km per hour (74 mph). It resembles a giant counter-clockwise spiral of clouds 300 to 1,500 km (930 miles) wide when viewed from space (figure above a). Such a storm is called a hurricane in the Atlantic and eastern Paciﬁc, a typhoon in the western Paciﬁc, and simply a cyclone around Australia and in the Indian Ocean. Atlantic hurricanes generally form in the ocean to the east of the Caribbean Sea, though some form in the Caribbean itself. They ﬁrst drift westward at speeds of up to 60 km per hour (37 mph). They may eventually turn north and head into the North Atlantic or into the interior of North America, where they die when they run out of a supply of warm water (figure above b). Weather researchers classify the strength of hurricanes using the Safﬁr-Simpson scale, which runs from 1 to 5; somewhat different scales are used for typhoons and cyclones. On the Safﬁr-Simpson scale, a Category 5 hurricane has sustained winds of >250 km/hr (>156 mph). The highest wind speed ever recorded during a hurricane was in excess of 300 km/hr. A typical hurricane (or typhoon or cyclone) consists of several spiral arms extending inward to a central zone of relative calm known as the hurricane’s eye (figure above c). A rotating vertical cylinder of clouds, the eye wall, surrounds the eye. Winds spiral toward the eye, so like an ice skater who spins faster when she brings her arms inward, the winds accelerate toward the interior of the storm and are fastest along the eye wall. Thus, hurricane-force winds affect a belt that is only 15% to 35% as wide as the whole storm (figure above d). On the side of the eye where winds blow in the same direction as the whole storm is moving, the ground speed of winds is greatest, because the storm’s overall speed adds to the rotational motion. Wind: Winds of weaker hurricanes tear off branches and smash windows. Stronger hurricanes uproot trees, rip off roofs, and collapse walls. capsize ships. Near shore, waves batter and erode beaches, rip boats from moorings, and destroy coastal property. 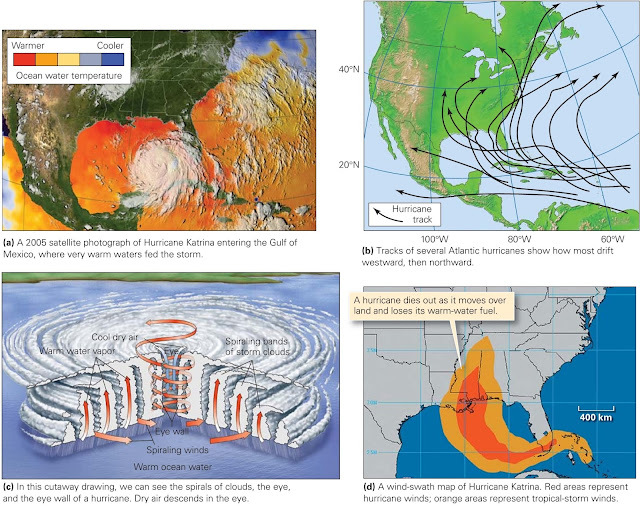 5 Storm surge: Rising air in a hurricane causes a region of extremely low air pressure beneath. This decrease in pressure causes the surface of the sea to bulge upward over an area with a diameter of 60 to 80 km. Sustained winds blowing in an onshore direction build this bulge even higher. When the hurricane reaches the coast, the bulge of water, or storm surge, swamps the land. If the bulge hits the land at high tide, the sea surface will be especially high and will affect a broader area. Rain, stream ﬂooding, and landslides: Rain drenches the Earth’s surface beneath a hurricane. In places, half a meter or more of rain falls in a single day. Rain causes streams to flood, even far inland, and can trigger landslides. Disruption of social structure: When the storm passes, the hazard is not over. By disrupting transportation and communication networks, breaking water mains, and washing away sewage-treatment plants, hurricane damage creates severe obstacles to search and rescue, and can lead to the spread of disease, fire, and looting. Nearly all hurricanes that reach the coast cause death and destruction, but some are truly catastrophic. Storm surge from a 1970 cyclone making landfall on the low-lying delta lands of Bangladesh led to an estimated 500,000 deaths. In 1992, Hurricane Andrew leveled extensive areas of southern Florida, causing over $30 billion in damage and leaving 250,000 people homeless. Hurricane Katrina, in 2005, stands as the most destructive hurricane to strike the United States. Let’s look at this storm’s history. Tropical Storm Katrina came into existence over the Bahamas and headed west. Just before landfall in southeastern Florida, winds strengthened and the storm became Hurricane Katrina. This hurricane sliced across the southern tip of Florida, causing several deaths and millions of dollars in damage. It then entered the Gulf of Mexico and passed directly over the Loop Current, an eddy of summer-heated water from the Caribbean that had entered the Gulf of Mexico. Water in the Loop Current reaches temperatures of 32C (90F), and thus stoked the storm, injecting it with a burst of energy sufﬁcient for the storm to morph into a Category 5 monster whose swath of hurricane-force winds reached a width of 325 km (200 miles). When it entered the central Gulf of Mexico, Katrina turned north and began to bear down on the Louisiana-Mississippi coast. The eye of the storm passed just east of New Orleans, and then across the coast of Mississippi. Storm surges broke records, in places rising 7.5 m (25 feet) above sea level, and they washed coastal communities off the map along a broad swath of the Gulf Coast (figure above a, b). In addition to the devastating wind and surge damage, Katrina led to the drowning of New Orleans. To understand what happened to New Orleans, we must consider the city’s geologic history. New Orleans grew on the Mississippi Delta, between the banks of the Mississippi River on the south and Lake Pontchartrain (actually a bay of the Gulf of Mexico) on the north. The older parts of the town grew up on the relatively high land of the Mississippi’s natural levee. Younger parts of the city, however, spread out over the topographically lower delta plain. As decades passed, people modiﬁed the surrounding delta landscape by draining wetlands, by constructing artiﬁcial levees that conﬁned the Mississippi River, and by extracting groundwater. Sediment beneath the delta compacted, and the delta’s surface has been starved of new sediment, so large areas of the delta sank below sea level. 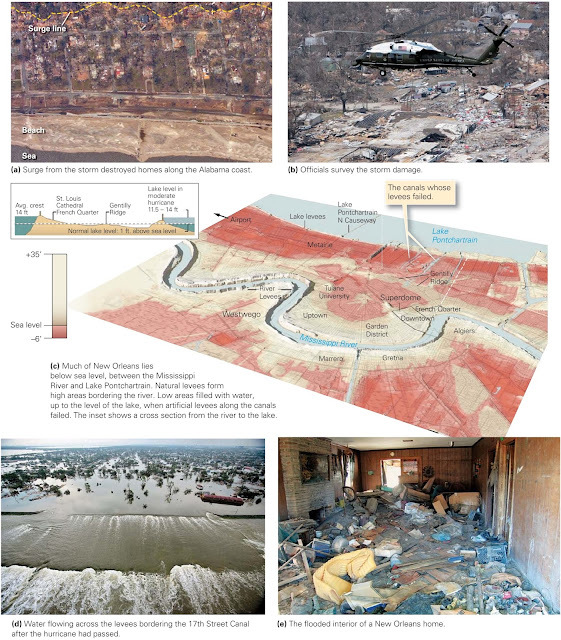 Today, most of New Orleans lies in a bowl-shaped depression as much as 2 m (7 feet) below sea level the hazard implicit in this situation had been recognized for years (figure above c). eye had passed, the high water of Lake Pontchartrain found a weakness along the ﬂoodwall bordering a drainage canal and pushed out a section. Breaks eventually formed in a few other locations as well. So, a day after the hurricane was over, New Orleans began to ﬂood. As the water line climbed the walls of houses, brick by brick, residents ﬂed ﬁrst upstairs, then to their attics, and ﬁnally to their roofs. Water spread across the city until the bowl of New Orleans ﬁlled to the same level as Lake Pontchartrain, submerging 80% of the city (figure above d). Floodwaters washed some houses away and ﬁlled others with debris (figure above e). The disaster took on national signiﬁcance, as the trapped population sweltered without food, drinking water, or adequate shelter. With no communications, no hospitals, and few police, the city almost descended into anarchy. It took days for outside relief to reach the city, and by then, many had died and parts of New Orleans, a cultural landmark and major port, had become uninhabitable. Coastal variability depends upon following factors. The tectonic setting of a coast plays a role in determining whether the coast has steep-sided mountain slopes or a broad plain that borders the sea. Along an active margin, compression squeezes the crust and pushes it up, creating mountains like the Andes along the western coast of South America. Along a passive margin, the cooling and sinking of the lithosphere may create a broad coastal plain, a ﬂatland that merges with the continental shelf, as exists along the Gulf Coast and south-eastern Atlantic coast of the United States. Not all passive margins have coastal plains. The coastal areas of some passive margins were uplifted during the rifting event that preceded establishment of the passive margin. For example, highlands formed during rifting border the Red Sea and portions of the Brazilian and southern African coasts. Highlands also rise along the east coast of Australia. 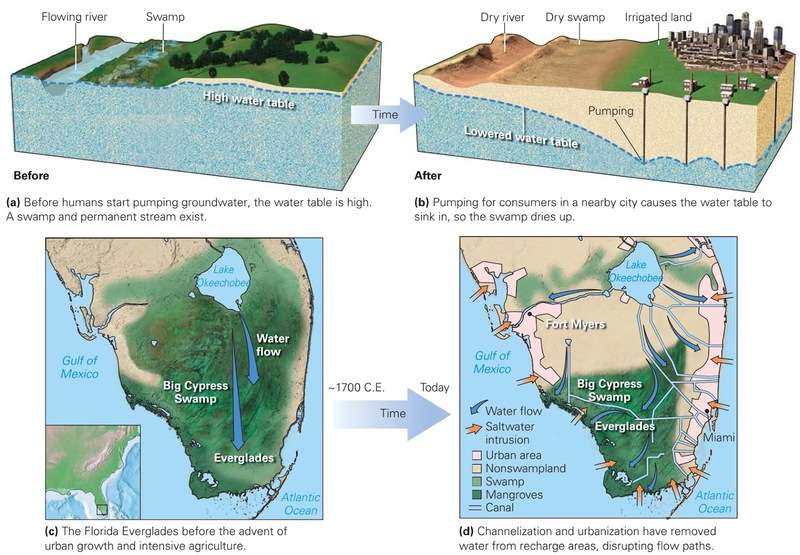 Because of sea-level drop during the ice age, there was more dry land. Sea level, relative to the land surface, changes during geologic time. Some changes develop due to vertical movement of the land. These may reﬂect plate-tectonic processes or the addition or removal of a load (such as a glacier) on the crust. 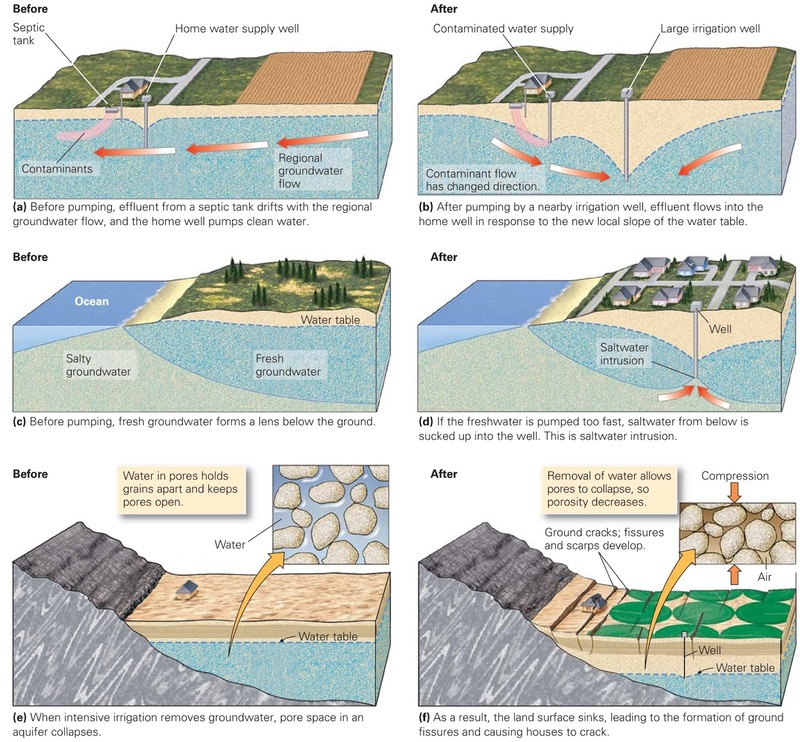 Local changes in sea level may reﬂect human activity when people pump out groundwater or oil, for example, the pores between grains in the sediment beneath the ground collapse, and the land surface sinks. Some relative sea-level changes, however, are due to a global rise or fall of the ocean surface. Such eustatic sea-level changes may reﬂect changes in the volume of mid-ocean ridges. An increase in the number or width of ridges, for example, displaces water and causes sea level to rise. Eustatic sea-level changes may also reﬂect changes in the volume of glaciers, for glaciers store water on land (figure above). As glaciers grow, sea level falls, and as glaciers shrink, sea level rises. 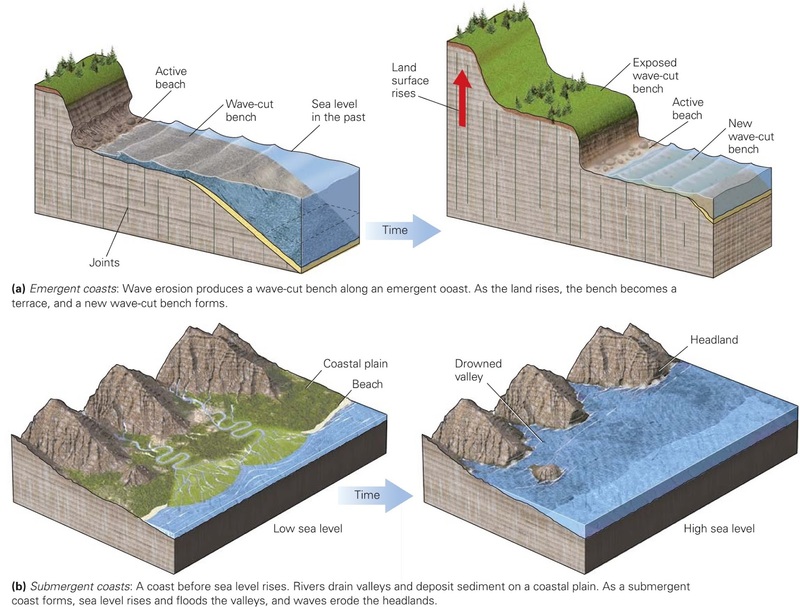 Features of emergent coastlines (relative sea level is falling) and submergent coastlines (relative sea level is rising). Geologists refer to coasts where the land is rising or rose relative to sea level as emergent coasts. At emergent coasts, steep slopes typically border the shore. A series of step-like terraces form along some emergent coasts (figure above a). These terraces reﬂect episodic changes in relative sea level and/or ground uplift. Those coasts at which the land sinks relative to sea level become submergent coasts (figure above b). At submergent coasts, landforms include estuaries and fjords that developed when the rising sea ﬂooded coastal valleys. The quantity and character of sediment supplied to a shore affects its character. That is, coastlines where the sea washes sediment away faster than it can be supplied (erosional coasts) recede landward and may become rocky, whereas coastlines that receive more sediment than erodes away (accretionary coasts) grow seaward and develop broad beaches. Climate also affects the character of a coast. Shores that enjoy generally calm weather erode less rapidly than those constantly subjected to ravaging storms. 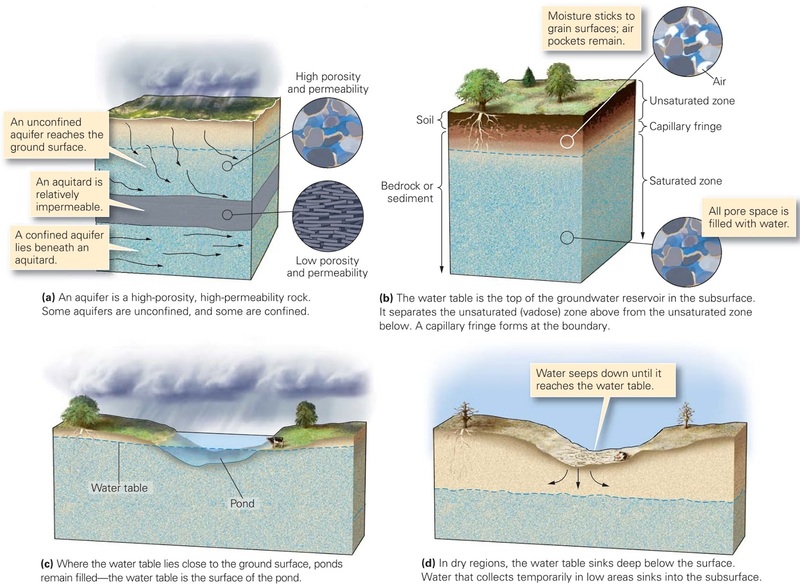 A sediment supply large enough to generate an accretionary coast in a calm environment may be insufﬁcient to prevent the development of an erosional coast in a stormy environment. The climate also affects biological activity along coasts. For example, in the warm water of tropical climates, mangrove swamps ﬂourish along the shore, and coral reefs form offshore. The reefs may build into a broad carbonate platform such as appears in the Bahamas today. In cooler climates, salt marshes develop, whereas in arctic regions, the coast may be a stark environment of lichen-covered rock and barren sediment. Tourists along the Amalﬁ coast of Italy thrill to the sound of waves crashing on rocky shores. But in the Virgin Islands sunbathers can ﬁnd seemingly endless white sand beaches, and along the Mississippi delta, vast swamps border the sea. Large, dome-like mountains rise directly from the sea in Rio de Janeiro, Brazil, but a 100-m-high vertical cliff marks the boundary between the Nullarbor Plain of southern Australia and the Great Southern Ocean. As these examples illustrate, coasts, the belts of land bordering the sea, vary dramatically in terms of topography and associated landforms. 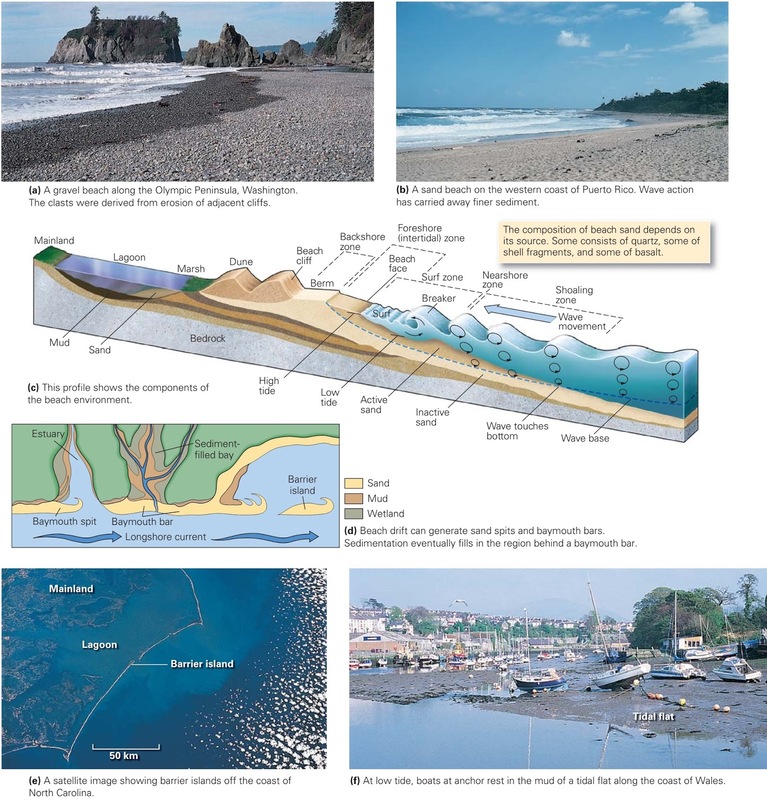 Characteristics of beach, barrier islands and tidal flats. For millions of vacationers, the ideal holiday includes a trip to a beach, a gently sloping fringe of sediment along the shore. Some beaches consist of pebbles or boulders, whereas others consist of sand grains (figure above a, b). This is no accident, for waves winnow out ﬁner sediment like silt and clay and carry it to quieter water, where it settles. Storm waves, which can smash cobbles against one another with enough force to shatter them, have little effect on sand, for sand grains can’t collide with enough energy to crack. Thus, cobble beaches exist only where nearby cliffs supply large rock fragments. The composition of sand varies from beach to beach because different sands come from different sources. Sands derived from the weathering and erosion of silicic-to- intermediate rocks consist mainly of quartz; other minerals in these rocks chemically weather to form clay, which washes away in waves. Beaches made from the erosion of limestone, or of coral reefs and shells, consist of carbonate sand, including masses of sand-sized chips of shells. And beaches derived from the erosion of basalt boast black sand, made of tiny basalt grains. A beach proﬁle, a cross section drawn perpendicular to the shore, illustrates the shape of a beach (figure above c). Starting from the sea and moving landward, a beach consists of a foreshore zone, or intertidal zone, across which the tide rises and falls. The beach face, a steeper, concave-up part of the foreshore zone, forms where the swash of the waves actively scours the sand. The backshore zone extends from a small step, cut by high-tide swash to the front of the dunes or cliffs that lie farther inshore. The backshore zone includes one or more berms, horizontal to landward-sloping terraces that receive sediment only during a storm. Geologists commonly refer to beaches as “rivers of sand,” to emphasize that beach sand moves along the coast over time it is not a permanent substrate. Wave action at the shore moves an active sand layer on the sea ﬂoor on a daily basis. Inactive sand, buried below this layer, moves only during severe storms or not at all. Longshore drift, discussed earlier, can transport sand hundreds of kilometres along a coast in a matter of centuries. Where the coastline indents landward, beach drift stretches beaches out into open water to create a sand spit. Some sand spits grow across the opening of a bay, to form a baymouth bar (figure above d). The scouring action of waves sometimes piles sand up in a narrow ridge away from the shore called an offshore bar, which parallels the shoreline. In regions with an abundant sand supply, offshore bars rise above the mean high-water level and become barrier islands (figure above e), and the water between a barrier island and the mainland becomes a quiet-water lagoon, a body of shallow seawater separated from the open ocean. Though developers have covered some barrier islands with expensive resorts, in the time frame of centuries to millennia, barrier islands are temporary features and may wash away in a storm. 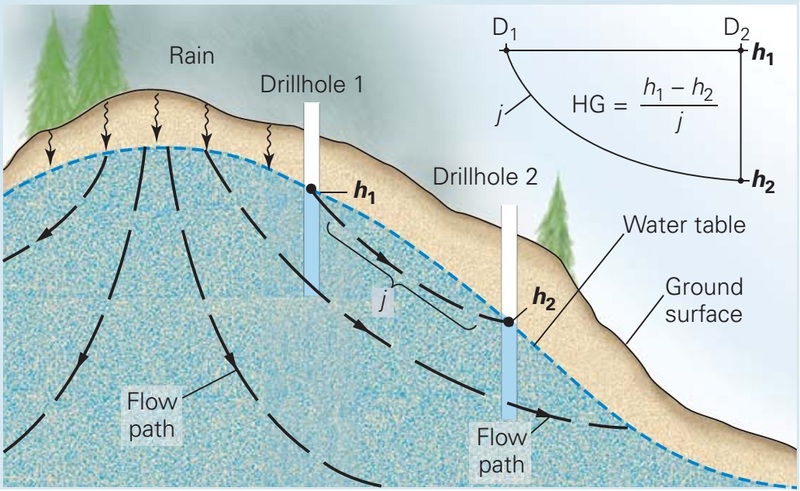 Tidal ﬂats, regions of clay and silt exposed or nearly exposed at low tide but totally submerged at high tide, develop in regions protected from strong wave action (figure above f). They are typically found along the margins of lagoons or on shores protected by barrier islands. Here, sediments accumulate to form thick, sticky layers. Erosion landforms of rocky shorelines. More than one ship has met its end, smashed and splintered in the spray and thunderous surf of a rocky coast, where bedrock cliffs rise directly from the sea. Lacking the protection of a beach, rocky coasts feel the full impact of ocean breakers. The water pressure generated during the impact of a breaker can pick up boulders and smash them together until they shatter, and it can squeeze air into cracks, creating enough force to push rocks apart. Further, because of its turbulence, the water hitting a cliff face carries suspended sand and thus can abrade the cliff. 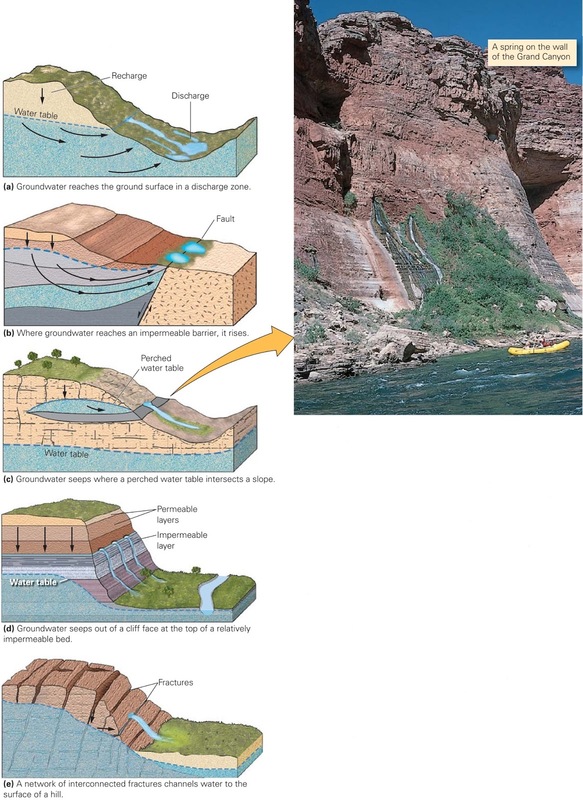 The combined effects of shattering, wedging, and abrading, together called wave erosion, gradually undercut a cliff face and make a wave-cut notch (figure above a). Undercutting continues until the overhang becomes unstable and breaks away at a joint, creating a pile of rubble at the base of the cliff that waves immediately attack and break up. In this process, wave erosion cuts away at a rocky coast, so that the cliff gradually migrates inland. Such cliff retreat may leave behind a wave-cut bench, or platform, that becomes visible at low tide (figure above b). Other processes besides wave erosion break up the rocks along coasts. For example, salt spray coats the cliff face above the waves and inﬁltrates into pores. When the water evaporates, salt crystals grow and push apart the grains, thereby weakening the rock. Biological processes also contribute to erosion, for plants and animals in the intertidal zone bore into the rocks and gradually break them up. Many rocky coasts are irregular with headlands protruding into the sea and embayments set back from the sea. Wave energy focuses on headlands and disperses in embayments, a result of wave refraction. The resulting erosion removes debris at headlands, and sediment accumulates in embayments (figure above c). In some cases, a headland erodes in stages (figure above d). Because of refraction, waves curve and attack the sides of a headland, slowly eating through it to create a sea arch connected to the mainland by a narrow bridge. 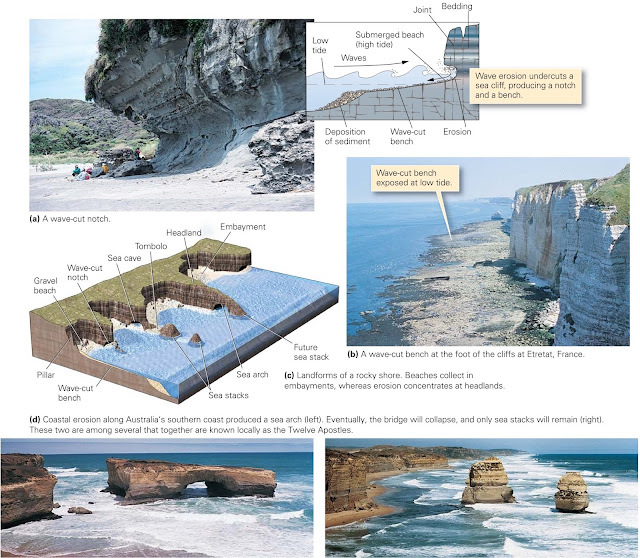 Eventually the arch collapses, leaving isolated sea stacks just offshore (figure above d). Once formed, a sea stack protects the adjacent shore from waves. Therefore, sand may collect in the lee of the stack, slowly building a tombolo, a narrow ridge of sand that links the sea stack to the mainland. 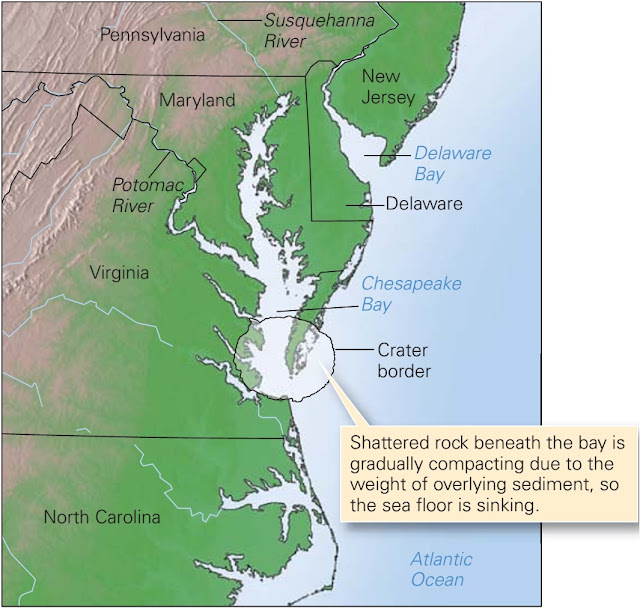 The Chesapeake Bay estuary formed when the sea ﬂooded river valleys. The region is sinking relative to other coast areas because it overlies a buried meteor crater. Along some coastlines, a relative rise in sea level causes the sea to ﬂood river valleys that merge with the coast, resulting in estuaries, where seawater and river water mix. You can recognize an estuary on a map by the dendritic pattern of its river-carved coastline (figure above). Oceanic and ﬂuvial waters interact in two ways within an estuary. In quiet estuaries, protected from wave action or river turbulence, the water becomes stratiﬁed, with denser oceanic salt water ﬂowing upstream as a wedge beneath less-dense ﬂuvial freshwater. In turbulent estuaries, oceanic and ﬂuvial water combine to create nutrient-rich brackish water with a salinity between that of oceans and rivers. Estuaries are complex ecosystems inhabited by unique species of shrimp, clams, oysters, worms, and ﬁsh that can tolerate large changes in salinity. Fjord landscapes form where relative sea-level rise drowns glacially carved valleys. 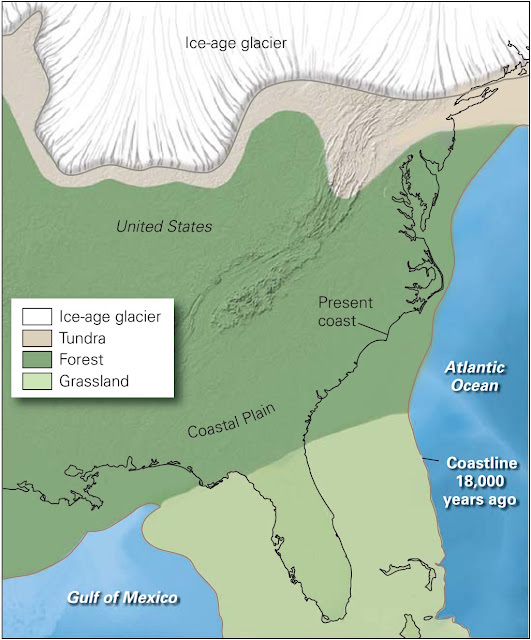 During the last ice age, glaciers carved deep valleys in coastal mountain ranges. When the ice age came to a close, the glaciers melted away, leaving deep, U-shaped valleys. The water stored in the glaciers, along with the water within the vast ice sheets that covered continents during the ice age, ﬂowed back into the sea and caused sea level to rise. The rising sea ﬁlled the deep valleys, creating fjords, or ﬂooded glacial valleys. Coastal fjords are ﬁngers of the sea surrounded by mountains; because of their deep-blue water and steep walls of polished rock, they are distinctively beautiful (figure above). A ﬂat-lying coastal area that ﬂoods during high tide and drains during low tide, but does not get pummeled by intense waves, can host salt-resistant plants and evolve into a coastal wetland. Wetland-dominated shorelines are sometimes called “organic coasts.” Researchers distinguish among different types of coastal wetlands based on the plants they host. Examples include swamps (dominated by trees), marshes (dominated by grasses; figure above a), and bogs (dominated by moss and shrubs). So many marine species spawn in wetlands that as a whole, wetlands account for 10% to 30% of marine organic productivity. In tropical or semitropical climates (between 30 north and 30 south of the equator), mangrove trees may become the dominant plant in swamps (figure above b). Some mangrove species form a broad network of roots above the water surface, making the plant look like an octopus standing on its tentacles, and some send up small protrusions from roots that rise above the water and allow the plant to breathe. Dense mangrove swamps counter the effects of stormy weather and thus prevent coastal erosion. The character and evolution of coral reefs. Along the azure coasts of Hawaii, visitors swim through colorful growths of living coral. Some corals look like brains, others like elk antlers, still others like delicate fans (figure above a). Sea anemones, sponges, and clams grow on and around the coral. Though at ﬁrst glance coral looks like a plant, it is actually a colony of tiny invertebrates related to jellyﬁsh. An individual coral animal, or polyp, has a tubelike body with a head of tentacles. Coral polyps secrete calcite shells, which gradually build into a mound of solid limestone whose top surface lies from just below the low-tide level down to a depth of about 60 m. At any given time, only the surface of the mound lives the mound’s interior consists of shells from previous generations of coral. The realm of shallow water underlain by coral mounds, associated organisms, and debris comprises a coral reef. Reefs absorb wave energy and thus serve as a living buffer zone that protects coasts from erosion. Corals need clear, well-lit, warm (18–30C) water with normal oceanic salinity, so coral reefs grow only along clean coasts at latitudes of less than about 30 (figure above b). Marine geologists distinguish three different kinds of coral reef, on the basis of their geometry (figure above c). A fringing reef forms directly along the coast, a barrier reef develops offshore, and an atoll makes a circular ring surrounding a lagoon. 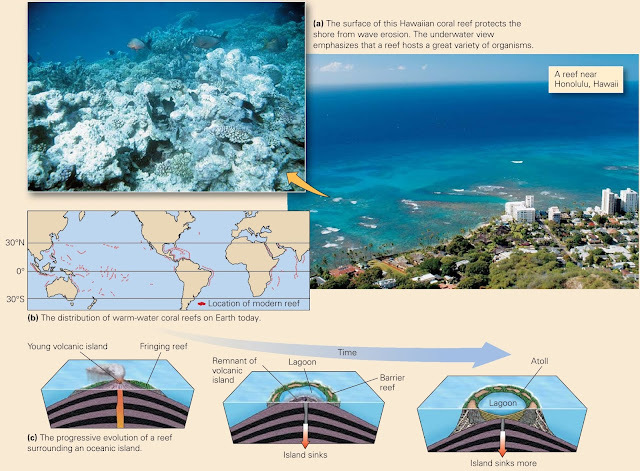 As Charles Darwin ﬁrst recognized back in 1859, coral reefs associated with islands in the Paciﬁc start out as fringing reefs and then later become barrier reefs and ﬁnally atolls. This progression reﬂects the continued growth of the reef as the island around which it formed gradually sinks. Eventually, the reef itself sinks too far below sea level to remain alive and becomes the cap of a ﬂat-topped seamount known as a guyot. Ocean waters and currents depends upon lots of things as below. If you've ever had a chance to swim in the ocean, you may have noticed that you ﬂoat much more easily in ocean water than you do in freshwater. That’s because ocean water contains an average of 3.5% dissolved salt; in contrast, typical freshwater contains less than 0.02% salt. The dissolved ions ﬁt between water molecules without changing the volume of the water, so adding salt to water increases the water’s density, and you ﬂoat higher in a denser liquid. There’s so much salt in the ocean that if all the water suddenly evaporated, a 60-m-thick layer of salt would coat the ocean ﬂoor. This layer would consist of about 75% halite (NaCl) with lesser amounts of gypsum (CaSO4s(2O), anhydrite (CaSO4), and other salts. Oceanographers refer to the concentration of salt in water as salinity. Although ocean salinity averages 3.5%, measurements from around the world demonstrate that salinity varies with location, ranging from about 1.0% to about 4.1%. Salinity reﬂects the balance between the addition of freshwater by rivers or rain and the removal of freshwater by evaporation, for when seawater evaporates, salt stays behind; salinity also depends on water temperature, for warmer water can hold more salt in solution than can cold water. When the Titanic sank after striking an iceberg in the North Atlantic, most of the unlucky passengers and crew who jumped or fell into the sea died within minutes because the seawater temperature at the site of the tragedy approached freezing, and cold water removes heat from a body very rapidly. Yet swimmers can play for hours in the Caribbean, where sea-surface temperatures reach 28C (83F). Though the average global sea-surface temperature hovers around 17C, it ranges between freezing near the poles to almost 35C in restricted tropical seas. The correlation of average temperature with latitude exists because the intensity of solar radiation varies with latitude. Water temperature in the ocean varies markedly with depth. Waters warmed by the Sun are less dense and tend to remain at the surface. An abrupt thermocline below which water temperatures decrease sharply, reaching near freezing at the sea ﬂoor appears at a depth of about 300 m in the tropics. There is no pronounced thermocline in polar seas, since surface waters there are already so cold. Imagine that you have a huge cannon aim it due south and ﬁre a projectile from the North Pole to a target on the equator (figure below a). If the Earth were standing still, the shot would follow a line of longitude. But the Earth isn't standing still. It rotates counter-clockwise around its “axis” (an imaginary line that passes through the planet’s centre and its geographic poles). To an observer in space, an object at the pole doesn't move at all as the Earth spins because it is sitting on the axis, but an object at the equator moves at about 1,665 km/h (1,035 mph). Because of this difference, the target on the equator will have moved by the time the projectile reaches it. In fact, to an observer standing on the Earth and moving with it, the projectile follows a curving trajectory. The same phenomenon happens if you place the cannon on the equator and ﬁre the projectile due north (figure below b)the projectile’s path curves because the projectile moves eastwards progressively faster than the land beneath while moving north. (The same phenomenon, of course, happens in the southern hemisphere, but in reverse.) This behaviour is called the Coriolis effect, after the French engineer who, in 1835, described its consequences. Because of the Coriolis effect, north-ﬂowing currents in the northern hemisphere deﬂect to the east, and south ﬂowing currents deﬂect to the west. The Coriolis effect because the velocity of a point at the equator, in the direction of the Earth's spin, is greater than that of a point near the poles. Since ﬁrst setting sail on the open ocean, people have known that the water of the ocean does not stand still, but rather ﬂows or circulates at velocities of up to several kilometers per hour in fairly well-deﬁned streams called currents. Oceanographic studies demonstrate that circulation in the sea occurs at two levels: surface currents affect the upper hundred meters of water, and deep currents keep the remainder of the water column in motion. The major surface currents of the world’s oceans. Surface currents occur in all the world’s oceans (figure above). They result from interaction between the sea surface and the wind as moving air molecules shear across the surface of the water, the friction between air and water drags the water along with it. The Earth’s rotation, however, generates the Coriolis effect, a phenomenon that causes surface currents in the northern hemisphere to veer toward the right and surface currents in the southern hemisphere to veer toward the left of the average wind direction. Across the width of an ocean, the Coriolis effect causes surface currents to make a complete loop, known as a gyre. Surface water may become trapped for a long time in the centre of the gyre, where currents hardly exist, so these regions tend to accumulate ﬂoating plastics, sludge, and seaweed. The “Sargasso Sea,” named for a kind of ﬂoating seaweed, lies at the centre of the North Atlantic gyre, and the “Great Paciﬁc Garbage Patch,” an accumulation of ﬂoating plastic and trash, lies at the centre of the North Paciﬁc gyre. Figure above is a simpliﬁcation of currents interactions of currents with coastlines create chains of eddies, in which water circulates in small loops (figure below a–c). The complexity of the ocean’s currents. An animation by NASA, based on data collected over a two-year period, shows the details of eddies and swirls in the ocean, and emphasizes that currents interact with the coasts. Surface water and deeper water in the ocean exchange at a number of locations. 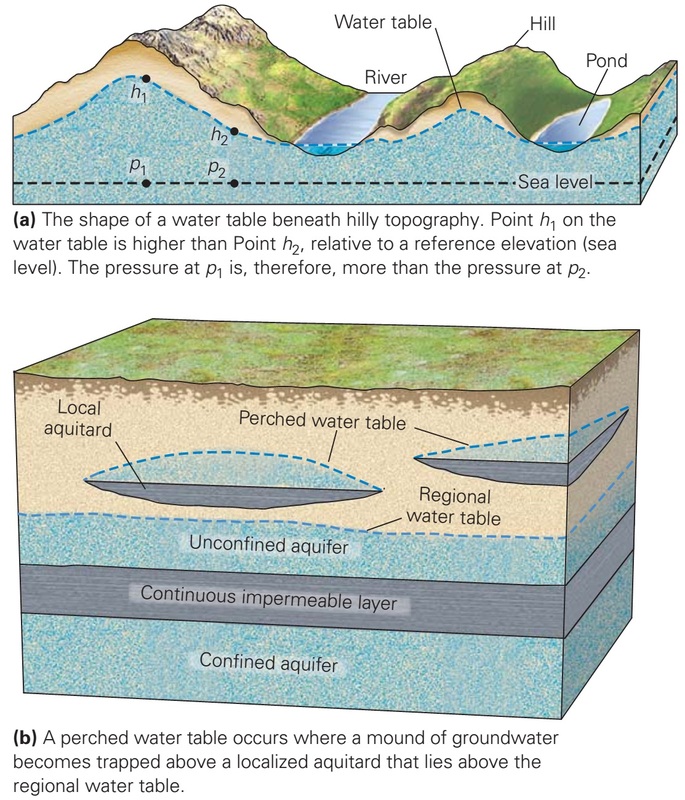 Speciﬁcally, in downwelling zones, surface water sinks, and in upwelling zones, deeper water rises. Downwelling and upwelling occur for a number of reasons. For example, in places where winds blow surface water shoreward, an oversupply of water develops along the coast, so surface water must sink to make room. And where winds blow surface water away from the shore, a deﬁcit of water develops along the coast, so deeper water must rise to ﬁll the gap. Upwelling of deeper water also occurs near the equator, where winds blow steadily from east to west, because the Coriolis effect deﬂects surface currents to the right in the northern hemisphere and to the left in the southern hemisphere, thereby leading to the development of a water deﬁcit along the equator. The resulting rise of cool, nutrient-rich water fosters an abundance of life in equatorial water. Global-scale upwelling and downwelling of ocean currents. Contrasts in water density, caused by differences in temperature and salinity, can also drive upwelling and downwelling. We refer to the rising and sinking of water driven by such density contrasts as thermohaline circulation. During thermohaline circulation, denser (cold and/or saltier) water sinks, whereas water that is less dense (warm and/or less salty) rises. As a result, the cold water in polar regions sinks and ﬂows back along the bottom of the ocean toward the equator. This process divides the ocean vertically into a number of distinct water masses, which mix only very slowly with one another. In the Atlantic Ocean, for example, the Antarctic Bottom Water sinks along the coast of Antarctica, and the North Atlantic Deep Water sinks in the north polar region (figure above a). 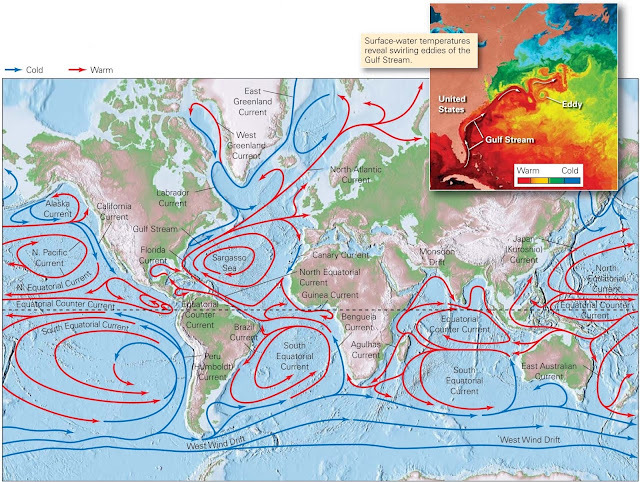 The combination of surface currents and thermohaline circulation, like a conveyor belt, moves water and heat among the various ocean basins and moderates global climate (figure above b).